The world of mixed media has exploded over the last several years. I have to admit, I have caught the bug and there’s no turning back. Have you seen an altered 3-D object or canvas with many textural elements and just wondered how the artist created it? I am always trying to pick things apart and figure out how they are made. I love the challenge of reproducing a cool effect or technique and even more, I love when unexpected results lead to something better than I couldn’t have imagined. There are many different tools and supplies to use in this area of artistic expression. It can get overwhelming especially if you are just starting out. I’m going to break it down for you and give you a list of supplies to get started and maybe a few tried and true techniques to help your imagination take off! Let’s break down some basic elements of Mixed Media! First, you need a substrate, which is the surface on which you are going to create. It can be paper, wood, fabric, metal or canvas. 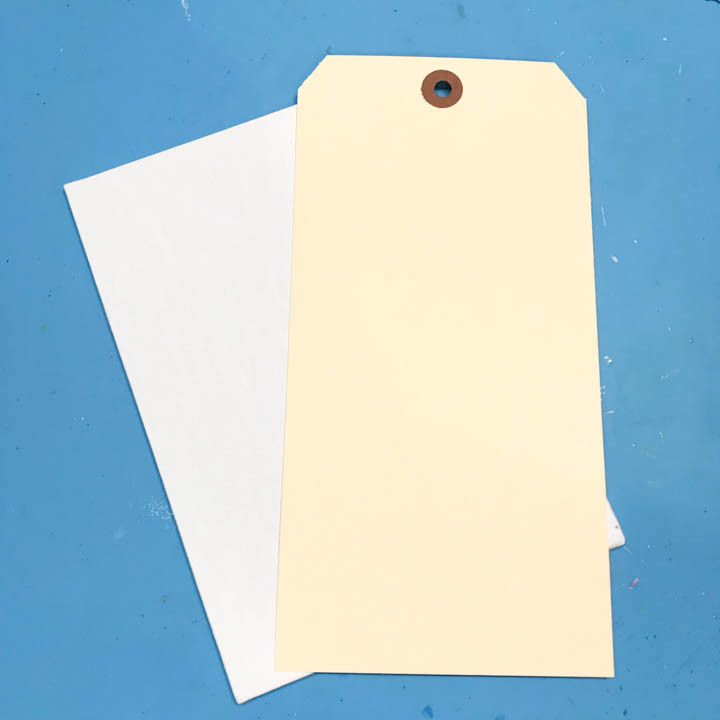 Here I have a paper tag and a canvas board. There are no limits on what type of substrate you can work on—the only limit is your imagination. 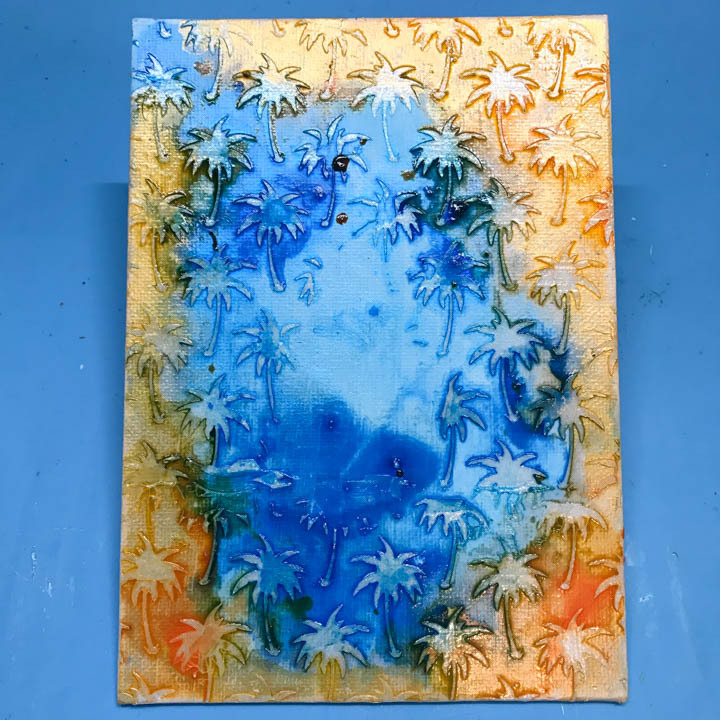 If you have a cool idea for a mixed media project, it is helpful to gesso your substrate. 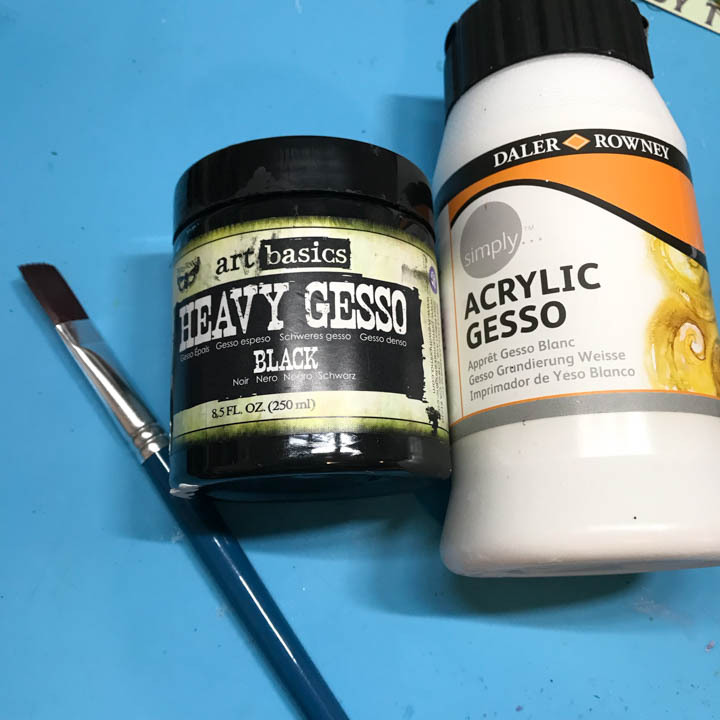 Gesso generally comes in clear, white or black and is used to prime the surface. It is not acrylic paint. 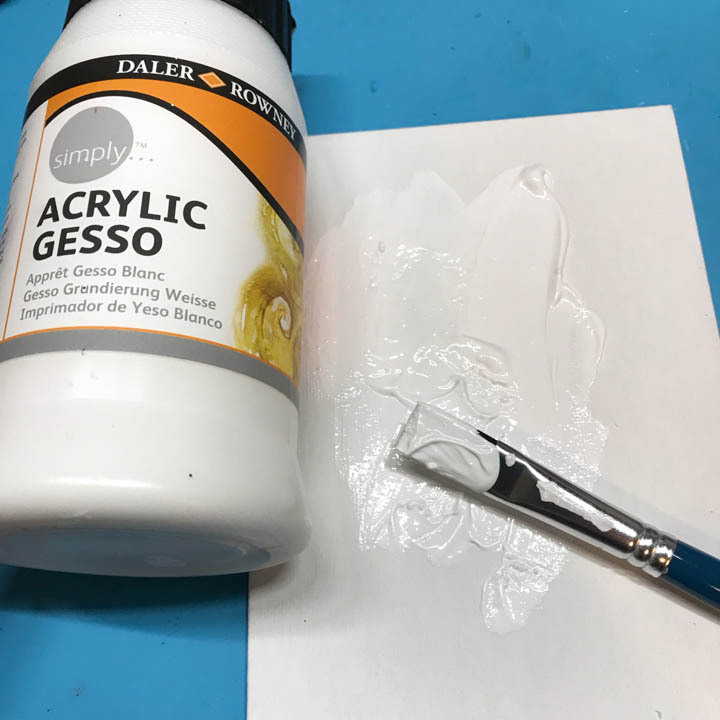 Gesso prepares your surface so that when you spray, paint, or stamp on it later, all pigments will behave the same way every time. 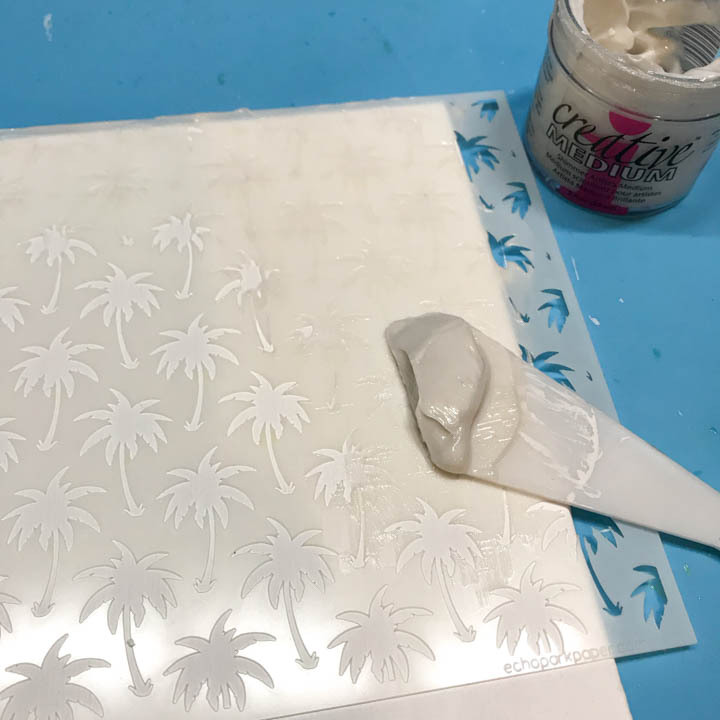 When you are working on different surfaces like paper, fabric, glass, chipboard, metal, resin, the best way to ensure your pigments are going to behave the way you expect is to cover everything with a layer of gesso first. It presents a neutral ground and you will have much better results. Coat your surface with a nice layer of gesso to prepare it for texture and pigment. Don’t forget to let it dry before moving on. Texture is a wonderful aspect of creating mixed media art. Texture allows the viewer’s eye to wander to all the fine details of the project. To create texture, you will need a type of texture paste and a palette knife. To make structured texture elements, you’ll also need a stencil or two. For each of these 3 items, there is a considerable amount of variation of product to chose from. Let’s start with texture paste. I’ll break them up into two broader categories. There is a gel, which comes in different finishes (glossy, semi-gloss, matte) and thicknesses. 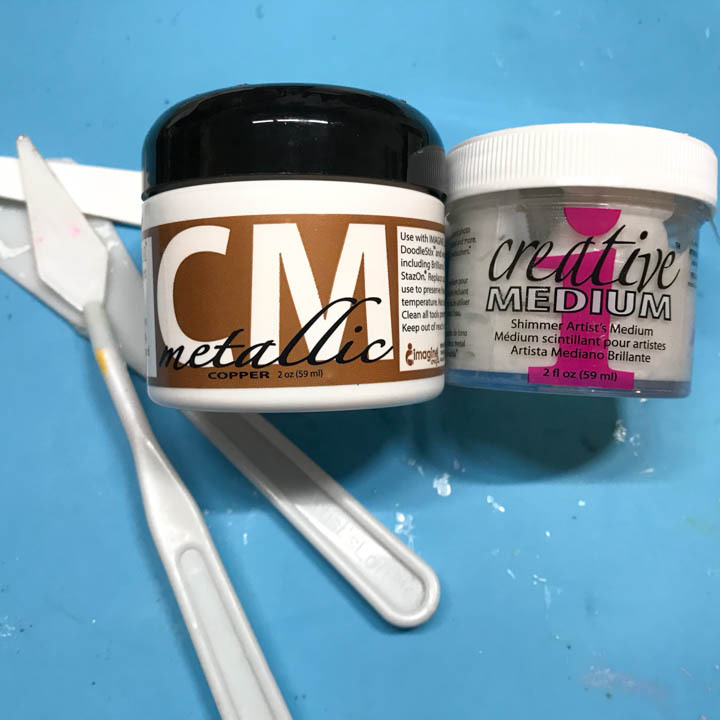 Imagine makes a great gel paste called Creative Medium. It comes in different metallic colors, iridescent colors, and clear. Gels that have a gloss finish tend to resist pigments when dried on a surface. This can be useful when the shiny resist effect is desired. Then there is modeling paste. These tend to be good as a strong adhesive for heavier objects. It is opaque and less flexible than gel. To spread these pastes, you need some palette knives. They come in different shapes and they are usually either plastic or metal. Both types of palette knives work well and it mainly comes down to a preference of the artist and the type of stencil you are working with. Scoop some of the texture paste, in this case Creative Medium, out of it’s container with a palette knife. Spread it over the stencil on to your surface ike you are icing a cake. You don’t need to cover your entire surface or use the entire stencil, just spread it where you want it. Lift off the stencil and let dry before moving forward. Finally, you get to add color! You have prepped your substrate and now it is ready to receive the colors and inks to create a theme and mood. Whether it is paint or ink, the pigments and colorants come in all types of mediums such as water-based, solvent-based or oil-based. Tsukineko and Imagine offer a variety of inks that work wonderfully with mixed media art. Imagine has Fireworks and Walnut ink sprays, irRESISTible colored texture sprays, and Pico embellishers. Tsukineko’s All-Purpose Ink is a rich dense pigment ink that can be used as a wonderful colorant. Depending on what you are creating and what effect you are trying to achieve there are many colorants to get your desired effect. Now that your surface is prepped and textured, you get to add color—my favorite part. Have fun! Check out more of Kassy’s awesome mixed media projects on YouTube! 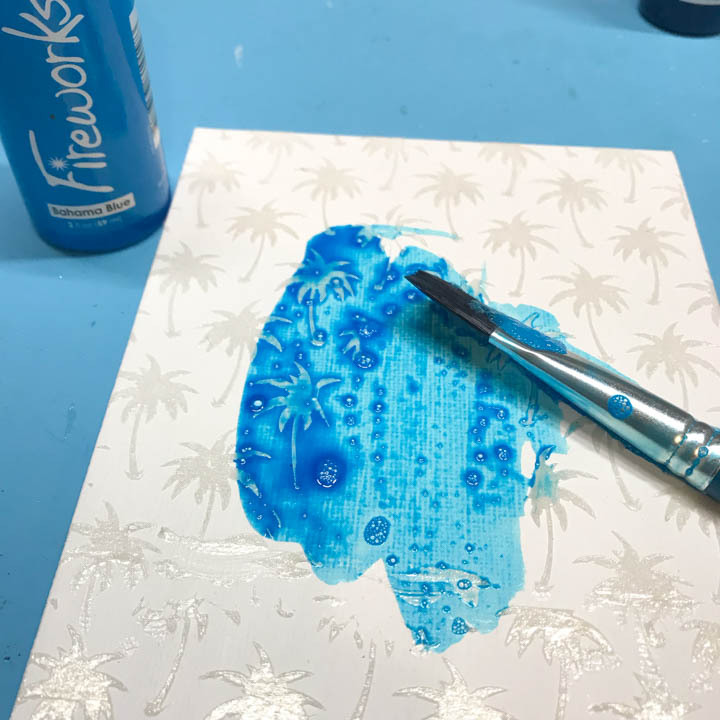 This entry was posted in 2018 ARTIST IN RESIDENCE, Advanced, Beginner, Cards, DIFFICULTY LEVEL, DIY, INSPIRATION, Intermediate, Kassy Tousignant, Mixed Media, Techniques, Tools, TOPICAL and tagged cardmaking, Cards, Creative Medium, DIY, DIY Inspiration, Fireworks Spray, Fireworks!, Handmade, INSPIRATION, Mixed Media, Paper Crafting. Bookmark the permalink. So many great ideas here! Thanks for sharing and I’m off to watch the video!